award-winning organization, every year since 2008! access on your mobile device. Note that all links in this center section open into a new window. 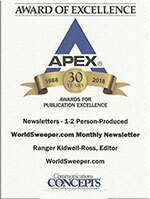 It is with great pleasure that we report WorldSweeper's free monthly e-newsletter is the recipient of a national APEX Award for Publication Excellence. This marks the 12th year in a row of the 13-year existence of the WorldSweeper.com website that some aspect of the overall project has won an APEX. Sign up here to receive our newsletter in your in-box each month. Our April Earth Day e-newsletter edition was distributed on April 22nd. The April newsletter offers a variety of information with an editorial discussing how environmental issues positively affect sweeping. If you didn't get your free e-newsletter copy delivered to your inbox, sign up at our Guestbook. Bucher Municipal has announced the grand opening of the Bucher Municipal Center of Excellence. The event is slated for May 8th and 9th in Ontario, California. The announcement says the Bucher Municipal Center of Excellence in Ontario, CA is the first of its kind in North America; as well as a brand new concept to Bucher's North American business partners. We are pleased to welcome new home page advertiser, Trombia Sweepers, featuring the multi-patented sweeper that fits onto front-end loaders and cleans to PM2.5 yet requires no filter cleaning. Trombia launched an expansion into North America at the National Pavement Expo 2019. Trombia sweepers are mechanical broom with air-assist and are PM2.5/PM10-certified in Europe to the highest category of the most advanced self-propelled vacuum sweepers. Please do check out this new technology from Finland. Curbtender reports a growth in network size that will allow the company to expand sales and service of its street sweeper products into 15 new states. In total, the company is now represented by 25 businesses with service locations across 27 U.S. states and 4 Canadian provinces. Elgin Sweeper and RoadBotics now offering sweepers equipped with AI-based pavement assessment technology to Florida municipalities. The technology assesses road conditions for infrastructure improvement decisions from sweeper cab. At the National Pavement Exposition, held in Nashville February 26th – March 2nd, the WorldSweeper.com/World Sweeping Association's Award of Excellence in Power Sweeping was awarded to Bridget and Warren Burge of Baton Rouge-based Clean Sweep, Inc.
Our feature newsletter story in February is a must-read article if you currently use one or more backpack blowers in your organization – "Battery-Powered Blowers: Ready to Meet the Sweeping Industry's Needs?" Sweeprite has returned to the North American marketplace. The line is being built by Merit Manufacturing, Inc., which is described as "a world class laser cutting, metal forming and fabricating company based in Kitchener, Ontario, Canada. A study from India reports sweeping pavement by hand is tough on the body. For the details, check out "Indian Study Confirms Musculoskeletal Issues for Street Sweeping Personnel." We added a detailed report on airport FOD removal in our February e-newsletter edition. Here's the link. Johnston Sweepers has announced the hiring of several new management personnel. Check out the information. Check out our latest exclusive advance preview of the next issue of SweeperMarket/PaverMarket , posted on February 7th. Remember: Our monthly online preview provides our readers with at least a full week's headstart on those who won't see the ads until the magazine arrives by mail! Our feature newsletter story in January is a must-read article compiled with an interview with Scott Cerosky, a 27-year insurance professional catering to the pavement industry. It's entitled "Learning From and Eliminating Sweeper Operator 'Incidents'." The U.S. Geological Survey, in cooperation with partner agencies, initiated a study called "Potential Reductions of Street Solids and Phosphorus in Urban Watersheds from Street Cleaning." In our historical collection of vintage sweeper brochures we have added what may be the very first such advertising for the then brand new Elgin Pelican. WSA is partnering with the Interlocking Concrete Pavement Institute (ICPI) to find and catalog sweeping contractors with the equipment and expertise to clean permeable (interlocking concrete) pavement. If that's something you know how to do be sure to confirm your expertise by taking the WSA/ICPI survey. We asked 18 sweeping industry professionals to predict the future of the power sweeping industry and captured the video of their responses. October marked the end of our six-part series, where starting in May and extending to October we released a YouTube video that had three industry pros predicting the future of power sweeping. You will certainly want to check them all out. We now have on the WorldSweeper website an in-depth analysis of the City of San Jose, California's street sweeping program. The report – which is 72 pages in length – is entitled "Street Sweeping: Significant Investment and Re-tooling are Needed to Achieve Cleaner Streets." We highly recommend anyone involved with street sweeping read the report. We will also have a podcast with San Jose officials in charge of sweeping in our November e-newsletter. This gives you time to tell us any questions you'd like asked at that time. Complete info is at this link. Patients of a state-run medical facility in a town in eastern Uzbekistan try to avoid Friday visits. That's the day doctors and nurses in Quvasoy have different duties to tend to – sweeping the streets and cleaning up garbage. As reported in our June e-newsletter, China has debuted the world's first driverless street sweeper. Global Environmental Products has announced it will be utilizing the fuel cell technology of U.S. Hybrid Corp. to produce hydrogen fuel cell-powered street sweepers, the first of which will go to Caltrans. Before you take your sweeping program for granted, check out this story: "Philly Residents Turn to Crowdfunding to Get Streets Swept." And, new to our archives cataloging sweeping around the world is this article: "A Night in the Life of a Street Sweeper Driver in India." In 2018 had the experience of receiving the Alan Curtis Industry Service Award at the recent National Pavement Expo. This award included installation into the U.S. Pavement Hall of Fame. I am proud and humbled to receive such a singular honor. Let's say you love your job as someone who sweeps streets every day, probably in the cab of a chassis-mounted sweeper... Now check out the article about Shang Wuji, who hasn't missed a day of sweeping the streets of China with a broom and wheelbarrow in 12 years – even though he only has one leg and was born deaf and dumb! Mr. Wuji is the latest person installed in our Noteworthy in Sweeping section. Risk transfer clauses are becoming a regular part of mall and third party contracts. Every sweeping contractor needs to read this article that discusses how to recognize and defend against risk transfer clauses. Are you aware of the latest generation of oils, which offer lower viscosity, higher fuel economy and longer drain cycles? Check it out with this link to FleetOwner. Craig Crissman, owner of Shenandoah Supervac has over two decades of experience as a diesel mechanic. That's what led him to doing a test with his Schwarze Gale Force to see if he could maximize the longevity of the DPF system. What you read may surprise you. When it comes to NASCAR there's only one vehicle that is featured at every race: That's the Elgin Track Sweeper. A recent segment of 'NASCAR Jobs' featured the Track Sweeper. Next time one of your sweeper operators complains about their job, we suggest to show them the dangers of being a sweeper in Jamaica, where most of the sweeping is done manually amidst drivers that a U.S. contractor calls "maniacs." Is one of your operator's problems that they might have to "jump into the nearby crocodile-infested swamp"?! Whether you were there or not, you'll want to check out coverage of the World Sweeping Association's 2017 Sweeper Roundup,TM – America's first-ever manufacturer-independent power sweeping conference and tradeshow , which was held in Kansas City, MO, the middle weekend of September. Has your organization implemented the guidelines needed to be compliant with OSHA's Silica Dust Rule, which started last September 23rd for construction work by companies with 10 or more employees? The City of Los Angeles is developing a pilot program to notify residents when the sweeper has passed their address. The intent is to reduce the number of parking citations issued for street sweeping. Two recent articles tout the advantages of power sweeping for reducing stormwater pollution runoff. One, by four members of Schwarze Industries' management team, called 'Runoff Pollution Prevention,' appears in Storm Water Solutions . The other, written by WorldSweeper's editor, is entitled 'Power Sweeping Contractors: Leading in the Defense of Clean Water,' appeared in PAVEMENT Magazine. Our Australia/India blog about power sweeping in Australia and India has won a prestigious APEX Award for Publication excellence! Click on the logo to learn more. Our sister organization, the World Sweeping Association, also received an APEX for the third year in a row for the value of the information provided in its twice-monthly WSA Member Update. If you are a contractor and are not yet a member of WSA you're definitely missing out on a cost-effective way to improve your business. Contractors: If you are presented with contracts with wording regarding 'omissions' then you need to read this article. Sweeper aficionado, McKinley "Kenny" Page, was the subject of an 18-minute video about his life-long fascination with street sweepers; most specifically, Elgin's classic Street King. The World Sweeping Association is offering to the industry a WSA Featured Podcast that was conducted between 'The Sweepin' Preacher, American Sweeping's Gale Holsman, and an anonymous sweeping contractor who needed help in getting profitable. The approximately 1-hour podcast, which includes an article edited from the podcast, is a must for any sweeping contractor that wants to get a better handle on expense and revenue info in their company. Remind yourself of the basics with our 'Broom Sweeping 101' article. Porous pavement is the gaining popularity very rapidly. 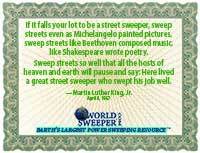 WorldSweeper offers BMP information about keeping it clean and functioning well. Have you seen the Minnesota Pollution Control Agency's BMP fact sheet for street sweeping? If not, perhaps you should take a look. We now have on the site a well-researched document by Washington State's Pacific Northwest Pollution Prevention Resource Center (PPRC) on how the sweeping of paved surfaces can reduce stormwater pollution runoff. Ever have a problem with drag shoes scraping newly sealed asphalt? If so, you'll want to read our article entitled "Ways to Eliminate Drag Shoe Scraping." Have you wondered how to tell a prospect or client how they can tell a quality sweeping contractor? Check out the article I wrote for Retail Facility Business on this topic. Are you a Facebook Fan of WorldSweeper.com yet? Our Fans often receive advance notice of our newsletter, as well as a variety of industry tidbits not meriting an actual article. Finally, if you are a vendor to the sweeping industry and don't yet advertise here, please consider doing so with either a banner ad or a Sweeping Products listing. As you can see from the logos above the headline, we have an RSS feed on the website, as well as links to our Twitter and Facebook accounts. These are easy ways to keep up with news at WorldSweeper.com. We also offer a web page that contains the latest articles we've added to the site. First time here? Please read my introductory welcome message. Take a look at our featured items below, or check out the complete contents of the site by choosing from the list to the left. GUESTBOOK If you haven't filled out our Guestbook, we can't send you late-breaking industry information. If you're involved with sweeping, please take time to provide us with your contact information. SWEEPING AROUND THE WORLD Sweeping is a worldwide industry, but the techniques vary enormously depending upon where it's being done. We have a number of stories about how sweeping is done in various locations of the world, many from the award-winning online travelogues penned by our editor while traveling in Asia, Australia and Europe. You'll want to take a look. WHAT'S NEW Here is where you'll find the latest stories we've posted online. You'll want to check often to find out the latest in industry news. STREET SWEEPING You'll find everything to do with street sweeping here. If that is the segment of the sweeping industry you are involved with, you'll want to check it out. SWEEPER SLIDESHOWS Want to see what sweepers used to be like? If so, you'll definitely want to check out our collection of old sweeper pictures. Some of the photos are even for sale, and what would look better on your office wall?! FEATURED SWEEPING ORGANIZATION We're proud to offer this feature story on our home page. Our current featured contractor is Louisiana-based Clean Sweep, Inc., owned by Bridget and Warren Burge, who have been sweeping contractors since 1990. The couple are the 2019 winners of the WorldSweeper/World Sweeping Association's Award of Excellence in Power Sweeping . If you'd like you or your organization to be considered for this honor, please let us know. This website relies on industry-wide support. The good news is the information we supply can be unquestionably independent. The downside is we must have the support of the sweeping community at large to keep WorldSweeper.com up-to-date and online. 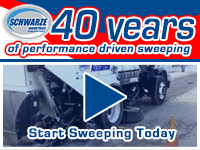 Because of the relatively small size of the sweeping industry, we need financial support from all areas of sweeping: manufacturers, contractors and the other vendors and suppliers of power sweeping equipment. If you like what you see and value the site, please support it via the low cost enhanced listings in our Contractor Locator and Browse Sweeping Products sections. If you would like to support the site through a donation of any amount, via either PayPal or a credit card, just click on the donation link shown below. If you would like more information, or to provide your input and ideas on the World Sweeper concept, please contact us via one of the methods shown in the left column of this page. We're trying to represent all viewpoints in the sweeping industry, so please feel free to let us know yours. "If it falls your lot to be a street sweeper, sweep streets even as Michelangelo painted pictures, sweep streets like Beethoven composed music, like Shakespeare wrote poetry. "Sweep streets so well that all the hosts of heaven and earth will pause and say: Here lived a great street sweeper who swept his job well." -- Martin Luther King, Jr. If you'd like an 8.5 x 11 copy of the certificate shown above, suitable for framing, click here or on the certificate image.